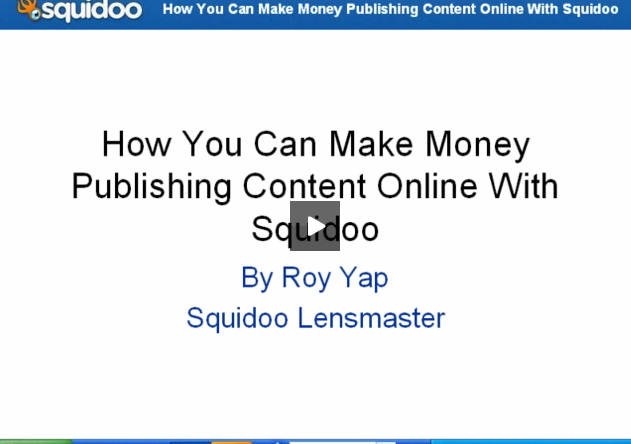 What’s Squidoo and How Do You Make Money? Squidoo is actually what we call a “community website” or what some people refer to as Web 2.0 where the content is created by the people. On Squidoo, we have pages that they refer to as “Lenses.” They call it “lenses” because Squidoo thinks that each page that the “Lens Masters” create is focusing on a certain topic. So, if we go to the Squidoo forum we can see that they will use words like “lenses,” which refers to the pages, and “lens master” as the people who write the lenses. In this case, I am also a lens master. You know what Squidoo is for. You have people going in to write the articles, and it’s all for free. What it is not, though, is first of all, it’s not a “get rich quick scheme.” So, yes, KC has mentioned that I am making over RM2,000 a month. It is not “a get rich quick scheme” meaning that if you start writing today, you would not be able to guarantee that in six months you’re going to make as much. In fact, a lot of people have been there for years, and they have to work very hard. What I am hoping to do is give you some tips so that, hopefully, you can monetize it faster than other people. Squidoo is just like any blog or any website that you can create. To monetize it, you need to generate traffic, and from the traffic you need to create sales. Squidoo, though, doesn’t generate traffic for you automatically. It doesn’t mean that as long as you write good content people will come and people will read. You still have to work on the other part of it which is to generate enough interest whether through social media, through your own blog, and through the search engines. You need to generate traffic. That is where the secret is actually. It’s no different from any other site – you’ve got to generate the traffic. If you don’t get any traffic, what’s the benefit of being a lens master? Why don’t you just start your own website? One of the best things is that Squidoo is free. If you have Internet connection, you can sign up with Squidoo. They give you all the tools that you need to do all your writing and publishing. It’s all free. They don’t charge you a single cent. The other benefit of Squidoo is that there is opportunity to earn money without spending a single cent of your money. I think that this the attractive part of Squidoo. At the very least, if you plan to write online and earn money online, I think Squidoo provides a good way to try it out without spending your money, signing up for a domain, signing up for hosting, which of course, nowadays, doesn’t cost a lot. But, if you just want to try it out and see if it is something that you’d be interested in and it’s something that you want to work on, Squidoo is a good way to do it because it’s free. Another advantage of Squidoo is that it’s highly-regarded by Google. What this means is that any content which is established in Squidoo, will get indexed by Google very quickly. In my experience, it’s usually less than 24-hours once you publish something on Squidoo. I would also like to touch on shortly my history, how I started with Squidoo. The first time I came across Squiddo was through one of KC’s articles. Prior to this I’ve already worked on many websites on my own. I’ve also written content for printed magazine here as well, tech magazine. I have never really tried monetizing my writing online. I mean, I did my own websites, yeah, but it’s more for my own interest. I don’t really care if anybody comes and reads it or not. After reading KC’s article, it dawned on to me, “Yeah, why not?” My original idea was to have $1 an article a month. So, if I can write thirty articles a month, $30 a month in USD, you convert to Ringgit… Why not? It’s pocket money and things like that. 1 Response to "What’s Squidoo and How Do You Make Money?" Thanks. This is a great sharing. Squidoo is for those who are looking to increase their monthly cash flow by just investing their time on doing topic research and writing.